I can only connect the SinusBot to Discord, how can I fix it? Download and install the latest 64-Bit TeamSpeak 3 Client for Windows. Download the SinusBot for Windows and start it. Be sure that "TeamSpeak 3 Support" is checked. 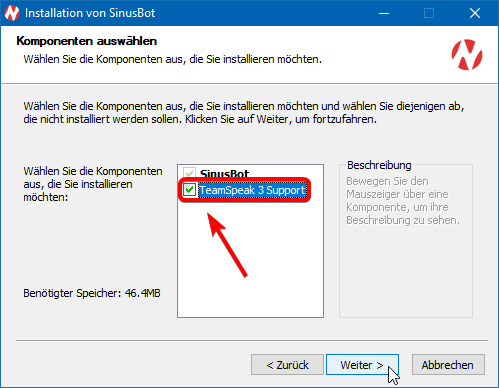 If the option is not available then the installer could not find a compatible TeamSpeak Client (latest version 64-Bit). If you continue installation without this checkbox enabled the SinusBot will only be able to connect to Discord. If that's still not working then make sure to uninstall any old and 32-Bit TeamSpeak Clients and reinstall the latest 64-Bit TeamSpeak Client in the default location.